Acrypol Metal-Kote is the metal protection solution from Acrypol that needs no priming and no sealing. One coat of Acrypol Metal-Kote and the 100% waterproof formula will seal around metal surfaces to protect from rust, rain and structural damage. Surfaces don't need to be blasted or sanded prior to application and just 1 coat will form an instant barrier in less than 2 hours. 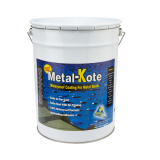 Drying no longer than 7 days, Acrypol Metal-Kote is the obvious choice for protecting metal roof sheets and guttering too.